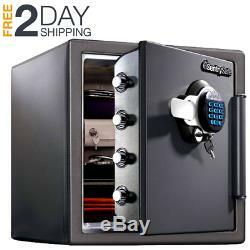 Fireproof digital safe steel combination lock box. Protect your valuables and digital media from fire/water damage and theft while giving yourself some peace of mind while you're away from your home or office with the heavy duty fireproof digital safe. 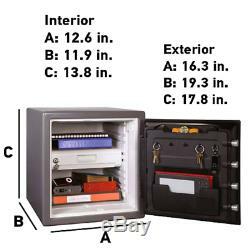 This large, durable security safe accommodates your most valuable items and documents, and is rated to protect against fire and water. 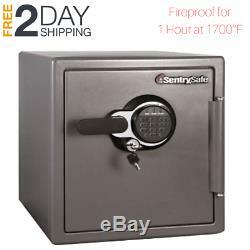 This safe features a pry resistant hinge bar, 4 large bolts, and interior organization options. This security safe box is also ideal for your electronics such as tablets, phones, external hard drives, memory cards, USB drives, CDs, DVDs, and more. 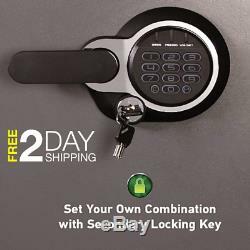 Simply lock with the digital combination lock with its easy to use design and audible clicking. The Home Security Digital Safe is UL Classified for fire and water protection so your most important items are safe for up to 60 minutes at 1,700 degrees F, and waterproof for 24 hours in 8 inches of water. Digital Lock & Dual Key Functionality. This digital lock allows users to create two personal 5-digit codes for easy, secure access. The key gives the owner the ability to disable the digital lock, even if other people know the combination. Large capacity to conveniently store documents and valuables in one location. ETL verified that the important information stored on USB drives, CDs, DVDs and portable hard drives will survive a catastrophe. Independent Underwriters Laboratory (UL) rated to withstand up to one full hour of fire exposure in 1700° F, keeping interior temperatures below the threshold of damage to your valuables. Third party verified to protect your valuables for a minimum of 24 hours in flood conditions. Foam gasket forms a durable barrier between the water outside your safe and your valuables inside. Solid steel construction, four 1 in. Locking bolts, pry-resistant hinge bar, and mounting hardware (included) provides added protection against theft. Solid Construction to Keep Your Valuables Secure. Designed to provide years of protection and dependable service, the fireproof digital safe features a solid steel exterior along with four 1-inch live-locking steel bolts that are 60 percent bigger than those on traditional safes. A pry-resistant hinge bar provides additional protection from forced entry, while a dual electronic lock and key deliver increased security. Included with the safe is a bolt-down kit that enables you to easily bolt the safe to the floor. Certified by Underwriters Laboratories (UL) and Edison Testing Laboratories (ETL) to provide one-hour fire protection. 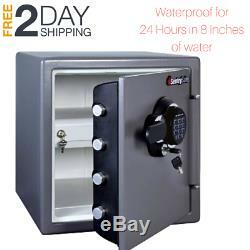 The safe can also sit in up to 8 inches of water for up to 24 hours without sustaining water damage. In addition, the SFW123GDC has been subjected to 15-foot drop tests, whereupon the contents remain intact and the safe remains locked. Smart Features for Greater Convenience. The Fireproof Digital Safe has several features to help keep your irreplaceable valuables organized. For quick access, the interior of the door has a key rack, a tray, and a pocket for small items like CDs and DVDs. An interior locking drawer provides additional privacy, while a bright interior LED light makes it easier to see your things. Other nice touches include a backlit keypad--handy when you need to access the safe in the dark--and a quick-access battery pack that makes it simple to replace batteries. The safe measures 17.8 by 16.3 by 19.3 inches on the outside (H x W x D) and 13.8 by 12.6 by 11.9 on the inside and weighs 87.3 pounds. What's in the Box. Fireproof safe is UL Classified to endure 1 hour at 1700°F and keep interior temperatures safe for irreplaceable documents, valuables, DVDs, and USBs; ETL Verified to withstand a 15 foot fall during a fire and remain closed. Waterproof safe is ETL Verified for 24 hours of protection in water up to 8 inches deep offering peace of mind in the event of a flood. 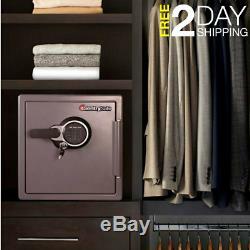 Set your own digital combination fire safe with secondary locking key for strong security; digital combination safe features four live-locking bolts, steel construction, pry-resistant hinge bar, locking drawer, interior light, and bolt down hardware. W x 19.3 in. D x 17.8 in. H; door requires 14.75 in. Of clearance to fully open; Interior: 12.6 in. W x 11.9 in. D x 13.8 in. H; large 1.23 cubic foot capacity; weighs 87 pounds. Please Do Not Open Case, it is very harmful to my store. The item "Fireproof digital safe steel combination lock box home security bolts waterproof" is in sale since Tuesday, October 16, 2018. This item is in the category "Home & Garden\Home Improvement\Home Security\Safes". The seller is "silverstarusa" and is located in Hollywood, Florida. This item can be shipped to United States.